People of today are obsessed with cleanliness. So much so that we even make antibacterial soap. We are trying to wash away things we can’t even see! But, it wasn’t always so. 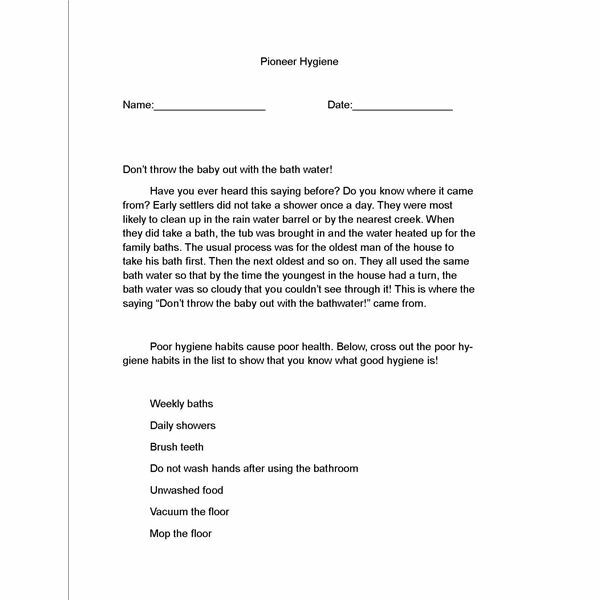 Discuss this history lesson plan with your students, then work through the history worksheet to reinforce what your students have learned about hygiene in the pioneer world versus hygiene of todays world. One way to start this history lesson plan is to talk with students about their own personal hygiene. Discuss with students some of the things they consider to be poor hygiene as well as some of the things they consider to be good hygiene. Below are some facts about pioneer hygiene. Read through them with your class. They will probably be shocked by some of the things the pioneers considered "clean"! Do you like to take baths? It’s pretty common for children to dislike bath time. So, we adults do things like putting toys and bubble bath in the tub with our children. Not so with the pioneers. Surely those children hated bath time too, but that may have been because everyone in the house shared the same bath water! By the time the children got to it, chances are it was barely warm because they were the very last ones to get to take a bath! Do you enjoy sweet smelling soap? Did you know that the pioneers bathed mostly with lye soap? This is a soap made from water, ashes and lard! Do you have to do dishes at home yet? Does your mother check to make sure you got all the dishes clean? Imagine being a pioneer who may have had to wash dishes in the creek! Pioneers sometimes washed their dishes in the creek. They had no scrub pads and sometimes had to use sand to get the dishes clean! Even if they washed the dishes in the house, they still had to fetch the water and heat it up. Pioneers sometimes did not get to wash their hair or body all week long. Bath day came once a week in the winter time. In the summer, pioneers may rinse off in the creek or river prior to bath day. With pioneers sometimes having as little furniture as one chair and one table, it would seem like housecleaning would be a breeze! However, there were no vacuum cleaners and they made their own brooms to combat the constant dust. Thinking of how the pioneers lived may make you look at your own home differently. How much time is spent in your home on cleaning the house and the people that live there? Pioneers would have felt blessed had they been able to be that clean!